Robbie Ventura is the founder and owner of Vision Quest Coaching. With a talented staff of world-class coaches, VQ provides expert training programs for over 500 endurance athletes of all levels from beginner to elite, including cyclists and triathletes ranging from 8 to 80 years old. Robbie graduated with honors from Lake Forest College with a double major in Business and Psychology. While working toward his Bachelors degree, he played on the Forester hockey team, which advanced to the NCAA Tournament. He was also named to the All-American Collegiate Cycling Team. In 2008, he was inducted into the LFC Athletic Hall of Fame for his accomplishments in both hockey and cycling. 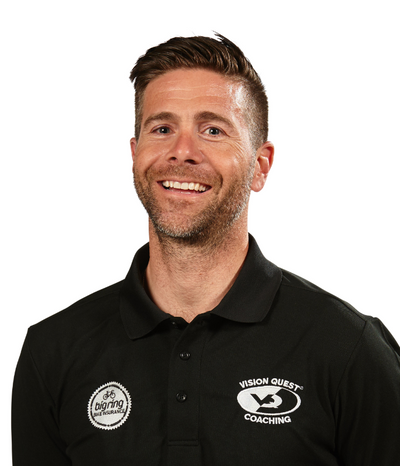 In 2000, Robbie started Vision Quest Coaching, a uniquely positioned program for endurance athletes focusing on high quality coaching delivered with the maximum benefits of the latest technology and training methodologies. The success of his athletes has helped VQ grow to five locations and, since opening, has helped thousands of athletes reach their potential in competitive athletic events. In recent years, VQ was named the official coaching service of TREK Travel. And, in his most aggressive expansion to date, Robbie is a partner in a 14,000-square foot facility that houses a state-of-the-art Vision Quest Performance Center as well as a TREK Concept Store. His own coaching certifications include: NCSF Personal Trainer, USAC Level 2, USAT Level II. Robbie also proudly serves on the Healthy Highland Park Task Force as a committed member of the community. Robbie made his TV debut with NBC Sports Network (then OLN) at the 2006 Tour de France, returning each year since as a cycling expert. In 2008, as a two-time winner, Robbie was named official race honoree for the 26th Annual El Tour de Tucson. 2008 was also the year that Robbie began his involvement with Chicagos bid to host the 2016 Summer Olympics. He was honored to serve as the lead designer for both the road race and time trial cycling courses. In 2011, that course design was used for Robbie Ventura’s Gran Fondo (“big ride” in Italian). Such rides are long-distance, mass-participation cycling events, not races, popular in Italy—and now in the US! When not training athletes, Robbie is spending time with his wife, Lori, and their four children: Luna, Enzo, Luciana and Raquel. In recent years he has also expanded his own competitive training and racing to include swimming and running, in addition to cycling. His first triathlon was the 2008 Ironman Canada with an overall total time of 10.49.01.